boooeee: Without wanting to interupt your excellent discussion with Rolfe, I'd like to raise one additional coincidence, perhaps the most mysterious, if we are to accept the Official Story. One would have to accept that the unaccompanied brown Samsonite suitcase containing the bomb device loaded in Malta by Megrahi then ended up, after its scenic journey through Frankfurt, in a Heathrow baggage container taking the place almost exactly of another brown Samsonite seen by John Bedford, before the Frankfurt feeder had landed. And the unknown brown Samsonite observed by the Heathrow loader Bedford, although claimed to have been moved 'to another far section of the container', was never recovered. The court asserted thus that the brown samsonite seen by Bedford was moved when the Frankfurt luggage was being loaded onto PanAm 103, and coincidentally another unaccompanied brown suitcase, this time with the bomb obviously, was placed almost exactly in the same position that Bedford's samsonite had occupied. Apart from the primary suitcase, no fragments of any other brown samsonite, no damaged brown samsonite, and perhaps most damning, no passenger who's luggage was loaded into that container by Heathrow's Bedford, before the feeder 103a had landed, owned or was in possession of a brown Samsonite suitcase. So, given this suitcase seen by Bedford was undoubtedly unaccompanied luggage (and was testified to at the Fatal Accident Enquiry), and was seen in the container before the frankfurt flight landed, in almost precisely the position it was subsequently determined by the AAIB investigators the bomb exploded, then where did it come from and why was no remnant was ever discovered? The only brown samsonite suitcase recovered from the wreckage of 103 was that of the primary suitcase, and the only observation of a brown samsonite was by John Bedford at Heathrow already in place in the baggage container 4041 in almost the precise position we know the bomb detonated. Now that's a pretty damning piece of coincidence. Last edited by Buncrana; 2nd April 2011 at 12:56 PM. The number of apparent coincidences in this saga is absolutely staggering. Half the work is to examine them and see which are really coincidences, and which aren't. I'm trying for a "minimum spooky coincidence" explanation, to a large extent. The thing is, my engagement with proponents of alternative medicine has opened my eyes to the sort of apparent coincidences that are common and not actually all that unlikely. It has also made me unusually aware of the mundane coincidences that occur every day, which we don't think of as significant beyond a "fancy that!" comment. In a case with as many ramifications as this, some genuine coincidences are inevitable. I'm not convinced the Heathrow break-in isn't a coincidence, actually. It's certainly not essential for the scenario - it was accepted that Heathrow security was so lax that anyone with the right uniform and pass could just have walked in and gone anywhere he liked. The relevance of the break-in is that it gives a way for the bomb suitcase to be smuggled in without the terrorist having to carry it in - something which just might have caused someone to take a second look. But it could have been carried in, that is not disputed. The Bedford suitcases, or at least the left-hand one (I think the right-hand one may have been Charles McKee's, but that's speculative), are probably more of a facer than you realise. John Bedford described that suitcase to Adrian Dixon of the Met in an interview on 3rd January 1989, before anyone had even noticed that there were bits of a maroony-brown Samsonite stacking up in the recovery shed that were eventually going to be identified as the bomb bag. Buncrana has covered the rest rather well, above. Tell me this, if the suitcase John Bedford saw wasn't the bomb bag, what was it? Who did it belong to, and how did it get there? The timing of the explosion is in a different category. It was never presented as a coincidence, as such. It was presented as something Megrahi or his associates chose to do, deliberately. Something completely and utterly irrational, supposedly done by intelligent, cunning people who were in other respects highly skilled planners. One. Fhimah wasn't at the airport that morning. Everybody at the airport knew him, and nobody saw him. His hypothetical presence was pure invention on the part of the investigation. Yes, Megrahi looks like a lucky strike. But I repeat, this is the sharpshooter's fallacy. Megrahi was only one of many Libyans who would have done very nicely, thank you. Whichever one it had been, there would have been something to declare about him, but he had this specific characteristic that is really, really suspicious. Megrahi would have had knowledge that would have been invaluable in planning such an exercise, certainly. Which really makes you wonder why certain aspects of the planning were so poor, actually.... On the other hand he had no background implicating him in any of the Libyan terrorist atrocities that were known about. He had nothing to do with UTA772 for example. He had no expertise in explosives, or record of handling them. He also did absolutely nothing suspicious while at the airport. He had no luggage, he didn't go airside, he didn't meet anyone. He was just there. No suitcase, no bomb, no unaccompanied bag, no break-in, no suspicious happenings noticed airside - nothing. He was there at the time a flight happened to leave that would have connected to PA103A via a four-hour stopover, sure. I don't find that such a huge coincidence, quite honestly. In essence, there was a suspicious Libyan at the airport in Malta that morning. How many mornings would that have been true of, I wonder? The other point is that the Erac printout can't be considered in isolation from the entire peculiar situation at Frankfurt. Frankfurt was on high terrorism alert at the time, because of the "Autumn Leaves" discoveries, and because of the Helsinki warning. How come these baggage records vanished - multiple copies all swept clean in a scorched-earth operation days after the crash, while the police were investigating at the airport? And not even a breath of blame or recrimination or even real explanation. Just, oh dear it's all gone, too bad. Given the strong reasons to be suspicious of all this, I can't regard that printout emerging as it did from this black hole of cover-up as unquestionably on the level. On the contrary, I rather think it's the small, visible tip of the iceberg of shenanigans at Frankfurt that day, that if we knew about, might mean we understood the how and the why of Lockerbie a lot better. Please, Fhimah wasn't there. Fhimah was acquitted because there wasn't a shred of evidence to connect him to the crime. The investigators made that bit up, then leaned on Giaka to make stuff up to support it. Once Giaka was revealed as having made his evidence up for money on the instructions of the CIA and DoJ, that was it. Free to go. In order to make Megrahi the perpetrator there, you have to make up so much that there simply isn't any evidence to support and ignore so much that points elsewhere, I simply cannot see how you regard it as at all likely. I once went to the opera using a ticket a friend couldn't use, and found myself sitting next to a very close friend of another friend of mine. The two friends had no connection, and indeed lived 400 miles apart. Fancy meeting you! These occurrences aren't especially uncommon. Malta was about the only way into and out of Libya at that time. There were a lot of Libyans passing through that airport every day. I can't agree that the chances of one of them who passed through at the right time having a suitably suspicious background were especially poor. Whoever it had been, you'd be saying, but look at this guy's particularly suspicious background, whatever it was. And bear in mind, it was in no way necessary for the Heathrow plot to be successful that there should be a suspicious Libyan at Luqa that morning. In that context, Megrahi was merely the icing on the cake - and not even very unlikely icing at that. Actually, no. The security at Malta airport was impressive, and thorough. They had a full set of records showing no unaccompanied bag on that plane, and it could be shown how it was next-to-impossible to get an extra bag on a plane at that airport. In contrast Heathrow leaked like a sieve, and Frankfurt - well, let's not go there right now, but there was an officially-sanctioned route for drug smuggling there, circumventing the x-ray screening. Of the three airports in the frame, the investigators chose to hammer and hammer at the one with the strongest security, and hand a free pass to the two that should have been hung out to dry. and at a point that would be difficult to trace back to the perpetrator. As you said, without the clothes, they probably would have never looked at Malta. Yes, these clothes. Not even an obvious mistake. The one thing that scuppered the entire enterprise, and yet a child would surely have seen the inadvisability of buying up Tony Gauci's brand new, locally-manufactured stock for that purpose. But these guys who had the positively supernaturally clever way to get an unaccompanied suitcase on KM180, that's what they did. But they did leave a lot to chance, given the circuitous route the bomb would have had to take in order to get on PA103. A lot could have gone wrong, and it didn't. Why didn't Kurt Maier, the "careful, conscientious operator", pull that case out for inspection? It contained exactly what he had been warned about, and he was working in an airport on high terrorist alert specifically about a plot to bomb a Pan Am flight to New York. Assuming Maier would miss that bomb seems a bit worse than just "leaving a lot to chance", I have to say. The only thing that you could argue went wrong is that there is probably no way they intended for the bomb to go off over land. Maybe the timer malfunctioned, or they did the time zone conversion wrong. You're reaching, now. They really set the timer for ten or eleven o'clock, did they, but it went wrong exactly in the time window to match with a PFLP-GC barometric device? Or they got the time zone wrong - for goodness sake, Malta is only an hour ahead of London, and that thing blew up three or four hours before any sensible detonation time. I'm sorry, but you're piling coincidence upon supposition upon improbability upon wild speculation, all to cling to the belief that it's impossible for a Libyan with a suitably suspicious background to have been in Luqa airport that morning by chance. The Heathrow scenario has the "Malta subterfuge" (even sounds like a Ludlum novel) that succeeded so spectacularly. And it too targeted a "soft point" in the security system (at a point where the bags had already been screened and x-rayed). But just like the Malta scenario, they seemed to leave a lot to chance. For one, the risk of capture seems far greater under the Heathrow scenario. Megrahi and Fhimah were at "home base", so to speak, while the Heathrow conspirators were staging active break-ins, most likely procuring stolen uniforms and security badges, and mingling in with baggage handlers and hoping nobody notices them. I don't know why you think Heathrow had a greater risk of capture. Heathrow is large and anonymous, and the staff are like a roll-call of the United Nations. Indian, Pakistani, West Indian, various flavours of African, you name it. And the staff turnover is pretty high. Nobody could look out of place there. And there were thousands of security passes unaccounted-for, and how hard do you really think it would be to get an appropriate uniform, really? It was accepted in court that anyone could have simply walked right in there. Megrahi was somewhere where a lot of people knew him, and where he left an ineradicable trail by using a passport that was legally issued to him and traceable to him, even if it wasn't in his own name. He certainly couldn't have merged into the background and posed as a baggage handler - not that there's any suggestion he did of course. Nobody knows how that case could have been put on the plane, because in that small airport a stranger airside would have had a high chance of being noticed. They also seemed particularly fortunate that nobody acted on the broken padlock in the 17 or so hours between its discovery and when the bomb was actually placed on PA103. I did read through Caustic Logic's hypothesis as to how this was done, and while an impressive and plausible piece of speculation, it still seems awful risky. Well, as Caustic Logic observed, if the broken padlock wasn't just a coincidence, it's quite likely the gap of 16 hours between the break-in and the shenanigans with the baggage container was deliberately planned to allow for that. If anyone was going to do anything about that break-in they would have done it by mid-day, surely. If there was no sign of police or heightened security, game on. I'm going to post this now, and add some thoughts below. I know exactly where you're coming from actually, because I've been there. Although I found the idea of a Lockerbie conspiracy theory attractive, having seen it proposed by some very credible people over the years, when I started looking at it I had a strong streak of scepticism. I was well aware of the 9/11 nonsense, having baited the odd truther for sport in my time, and I had an underlying suspicion that I might well end up as the "Gravy" of Lockerbie. However, the more I looked the more I realised that the entire construct of the Malta introduction rested on quicksand, despite the Erac printout, and despite Megrahi's being in a very singular place that morning in the context of the Malta hypothesis. There's only so much work you can do shoring up that quicksand, before you realise that the smart money is to jump to the solid ground of Heathrow. First, you agree that Megrahi didn't buy the clothes. We have no idea who bought the clothes. That's the only incriminating thing Megrahi was ever alleged to have done, of course. But we agree that the clothes were bought by some member of whichever terrorist team actually carried out the atrocity. If this was done in connection with the Malta introduction, what was that all about? Lay a trail that leads right back to the island where the bomb was smuggled on board, invisibly? On purpose? And don't say, oh the timer malfunctioned and the evidence was supposed to be lost at sea. The bomb could have been misrouted or intercepted, with all these traceable clothes right there, and the terrorists would have known that. It's batsqueak insane. Next, please tell me how you think the suitcase got on the plane at Malta? There was a full set of records showing no unaccompanied luggage on that plane. Unlike Frankfurt and Heathrow, Malta counted bags, and there was no discrepancy. The records didn't go missing, and were produced promptly when requested. The Lockerbie investigation spent months and indeed years trying to knock a hole in this. They tapped people's telephone lines and intercepted their mail and interrogated their acquaintances. They were convinced that the entire Malta ground staff and security operation had been suborned by Libya, that all the records were fabrications, and that most if not all the staff were lying. These staff were Maltese by the way, devout Catholics, and Libyans weren't exactly popular in Malta even though the Maltese government was cosying up to Libya at the time. But they were held to have co-operated in smuggling a suitcase on to a plane, and falsifying the relevant records, and then carried on lying about it even after an atrocity that claimed 270 lives. The investigation bust a gut trying to find some evidence for this theory. They found absolutely nothing at all, all they did was piss off the Maltese staff who got tired of not being believed and being assumed to be accessories to a terrorist outrage. In the end, all they could present to the court was, well, it must have happened anyway. This is actually a far bigger conspiracy theory than anything the PFLP-GC proponents are proposing. Do you subscribe to it, or do you have some other explanation for how the bomb suitcase got on that plane? Remember, all Megrahi did that morning was check in for LM147 (with only cabin baggage) and catch his plane. No other possible accomplice was ever identified. Frankfurt airport was under high terrorist alert in December 1988. The Autumn Leaves raid had happened about two months before, and it was known there were more devices at large. Staff had been provided with descriptions of the PFLP-GC device in the Toshiba radio, and photos of what to look for. Maier had that material. 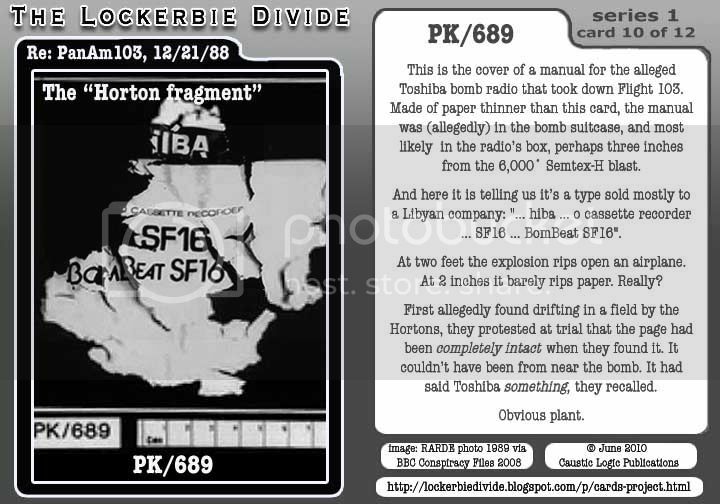 And the Lockerbie device was exactly that - a Semtex IED hidden in a Toshiba radio. Then again, there was the Helsinki warning. Turned out to be a hoax, or so we are told. But at the time, it was taken semi-seriously. It specifically named a flight from Frankfurt to New York being targeted in pretty much that time window, with an Icelandic girl being used as a mule to carry an IED on board in her luggage. What on earth gave the Malta conspirators the idea this device would get past Frankfurt? There was only about 450g of Semtex. It had to be in pretty much the right position in the plane to cause a fatal crash. The chance of a randomly-placed bag being in the right position was considerably less than 50%. It's actually worse than it's claimed to be. It's usually implied that so long as the bomb bag was on the outboard side, then it would have worked. This is not necessarily so as far as I can see. The Semtex wasn't central in the case. It couldn't have been. The explosion was so close to the outside of the container, that the radio must have been packed right at one side of the case. Get the case the right way round, paydirt. Load it in the same position but the other way round, not so much. The case wasn't just in the right location to cause the necessary damage, it was in the right orientation. And yet, with the Malta loading theory, the terrorists would have had no control over this aspect at all. We've been over this. I'm afraid, when you have to resort to speculating that the timer coincidentally malfunctioned to mimic a barometric device, or that the terrorists managed to make an error of three or four hours when setting the device, you're struggling. Buncrana explained this. Certain evidence that was led at the FAI was omitted at Zeist. (Spotting this may be my main claim to fame in Lockerbie research.) Put it all together, and it's dynamite - or possibly Semtex. Bedford saw that case almost in the position where the bomb bag was subsequently determined to be. He didn't put it there. Kamboj says he didn't put it there either. Whoever put it there had the opportunity to place it exactly as he wanted it, outboard side and in the desired orientation. The case as Bedford described it, exactly matched the description of the bomb bag. Subsequent enquiries by the Scottish police (John Crawford and Derek Henderson) established that no passenger had any luggage matching the description of the bomb bag - therefore, the Bedford bag was not legitimate passenger luggage. No other suitcase matching he description of the Bedford bag was recovered at Lockerbie, apart from the bomb bag itself. If the case Bedford saw wasn't the bomb bag, whose was it and how did it get there? And where did it vanish to? I know it's a bit of an emotional leap to believe that the Zeist verdict could be wrong. But after looking at the details of the evidence, and of course the dishonesty in the conduct of the investigation, there comes a point I feel where there is nowhere else to go. I agree the Erac printout, at face value, is quite a striking coincidence (though I'm not sure that face value is necessarily the right way to take it). But that's the only thing that emerges as at all out of place in the theory that says Megrahi was simply minding his own business (or maybe Gadaffi's business of course) that morning, on the island where the decoy clothes had been bought a month earlier, the day the PFLP-GC chose to activate their plan to introduce a bomb into a luggage container in the interline shed at Heathrow airport, a thousand miles away. Sorry I've been sitting this out. Busy times, crazy new ideas, and Rolfe's got this covered and then some. I've also been sitting on this all day, so apologies if I'm being redundant. I'd also like to echo Rolfe's welcome for real discussion on the evidence. It's been a while since anyone tried. Please don't take offense if some of my lines below are snappy - it's ideas I'm snapping at, not you. I'd add there are other logical possibilities ... but to prevent unncessary headaches, I'd take Rolfe's reading on this. It would apparently then be a coincidence that Malta aalso fit so well with an available loose agent to bolster an alternate Libyan guilt story line. I tend to be suspicious of such coincidences, but perhaps the clothing was the one real coincidence that sealed the deal to take the whole blame there. This is only coincidental with the clothes, in my opinion. "At least one" is far more accurtate than two, since no one saw Fhimah there that day. He was a well-known face, and he was asked after, but if he was there, it was all by secret side entrances and hiding from everyone, or a lot of Luqa airport staff were covering for him. Investigators never decided which it was, just that he had to be there, since Megrahi couldn't have actually loaded the suitcase. Even though he was at the airport, his business there gives him an alibi (boarding his own flight), and the necessary accomplice has nothing to show even being there. That's part of why the judges found him "not guilty." Personally, I don't think that's a coincidence at all. It's unverifiable, late-appearing and surrounded by mystery. It was vouched for by German authorities with the BKA and the airport, and cleared them of the initial security breach the Brits had stuck them with, by shifting it to Malta. But, as has been mentioned, the solid and complete records of Air Malta contradict an unaccompanied bag, just as clearly as the staff failed to record Fhimah's presence (same basic options here). What keeps me with the Megrahi scenario is that these were not just any random "suspicious Libyans", but the exact type of people you would need in order to pull off the Malta to Frankfurt to Heathrow transfer. Megrahi was former head of security at Libyan Arab Airlines and Fhimah was a station manager at Luqa airport in Malta. And Megrahi had traveled to Malta just the night before and returned to Tripoli with Fhimah the next day. 1) Relative lack of Libyan motive for this type of attack at that time, compared to Iran. 3) Heathrow is the only of the three airports with a security breach that was (accidentally?) covered-up and totally ignored from 1989-2001. 4) And it was the only airport at which a brown, hard-shell Samsonite case, found to be the luggage of no one on that flight, was seen in the lower outboard corner of AVE4041, before that alleged Maltese copy of the same type case had even landed there. Now, show me two Libyan airport security experts operating out of Heathrow, and we might have something. But Malta? Paperwork says that's compelling and in fact truth. But reality seems to disagree. I did read through Caustic Logic's hypothesis as to how this was done, and while an impressive and plausible piece of speculation, it still seems awful risky. Well, thanks. And yep. Welcome the no-free rides (but some fairly cheap rides) world of airline terrorism. If you know the lower outboard corner trick and can blend in air-side, do the placement yourself, you have a good chance of it working, and just walking away before anyone suspects something is wrong. Airports generally all want to avoid bombings, so I don't think any of them would be "home base" for someone planning a bombing. Capture or at least disruption is a real possibility anywhere, so I think costumes and manual subterfuge would be much smarter than just checking it in by the normal system two airports away. I posted something in the London Origin thread, relating to the above. It's probably a small point, but it seems to me the case was probably packed with the radio located not centrally or along the spine, but along the left-hand side. Pretty unintuitive way to pack a case, if you have no control over how it will eventually be placed in the container. Exactly how you'd do it if you were anticipating that it would be you who would be the one to choose exactly how the case would be oriented in the container, though. Discuss, probably in the other thread. While we're trading coincidences, I've explained what I think tray B8849 was (if the whole Erac printout thing is on the level which I have some doubt about). I think it was a stray item for PA103A (not necessarily for PA103) which was put through station 206 while the Malta luggage was being coded, and nobody took the time to make a separate entry for it. I think the same thing happened at the station the Warsaw flight was being coded at. I think this happened all the time, and if it had been possible to scrutinise the complete set of records for the day, that would have been clear. So from the point of view of the other side of the discussion, if the Bedford bag wasn't the bomb, what was it, how did it get there, and where did it vanish to? Saif al-Islam Gaddafi told the BBC's world affairs editor John Simpson that Mr Koussa had travelled to Britain for health reasons and was being pressured into making allegations about Libya's government in an effort to secure immunity from prosecution. Mr Gaddafi said Moussa Koussa was allowed to leave Libya, and denied that he knew incriminating details about the Lockerbie bombing or other atrocities. "The British and the Americans they know about Lockerbie, they know everything about Lockerbie so there are no secrets anymore," Mr Gaddafi said. LGR: Saif is savvy. But that's not enough, obviously, these days. He swears Kusa didn't go there TO defect, but had to be there for medical treatment - UK of all places, right now of all times? He does concede he's now being pressured to defect, trading immunity for telling us, preferably, what we've already decided. He does predict we might hear "funny stories" before this is all said and done. Indeed, if anyone down there really has a lot of blood on his hands, it's this guy, but he's to be forgiven in trade for helping destroy the system Gaddafi created and the West has hated and dreamed of smashing for decades. That's clearly not justice, but rather politics/imperialism, IMO. Following is my version of one of Rolfe's "epic wall posts". It's a bit of a condensed version of events / arguments, so sorry for those who aren't up on previous posts. ...Yes, Saif. Everyone knows everything. That's why there are still so many questions. Sikora? He wasn't the doctor who mattered. You have evidence Dr, Kay was paid by Libya? No mistake, I do personally doubt all 3-month progonoses. Considering things that could be traded, and apparently were traded, there are other parties aside from Libya who'd find an early release ticket of great value. It's all about the baggage at Malta! No baggage loaded at Malta! BUT what baggage exactly did Megrahi arrive on Malta with? YEt he LEFT WITH NO BAGGAGE. After spending the night on Malta. HE allegedly checked no baggage upon his departure, whilst going through ZERO, oh so tight and "perfect" security upon his departure from Malta ???? I honestly don't know the answer to what he arrived with. Could you please explain what you know about that and how? In case you missed it, I'll ask again: Could you please explain what you know about that and how? I had thought it was none both in and out, but I'm not certain and don't have the info handy. This isn't uncommon. Only three checked pieces I think between 4 Larnaca interline guys, and two of those belonged to one guy (IIRC). You can do a lot with the allowed amount of carry-on luggage at that time, I'm sure. Yet you'll bring this up blithely, just because of Prof. Black's less than ideal phrasing of that at one point. Let's see, yep you even put "lie" in all caps. Care to copy over that LIE? Exactly what he said, and why it's so deceptive compared to something else you could show, or at least explain well enough that someone could double-check it? Put the E in JREF? I'm presuming no as usual, but feel free to show me wrong. The only LIE here, with the Malta weather records, is the investigation's, accepted blindly by those at Camp Zeist and here and elsewhere. Please, Bunntamas, if you must keep at this, it would behoove you to listen and learn a little from the other side. And/or back up any of this nonsense you post. How much of that cash is the JFM committe getting from Megrahi that he otherwise spends on to building his OTHER new home and cruising around with his driver in his red Ferrari? Again, absolutely ZERO as far as I know. There is NO MONEY in JFM. You'll have to look for another sinister motive, since you're absolutely blind to the fact these are human beings who can, occasionally, be driven by noble motives. Your complete rejection of that possibility here is just not reasonable. I wouldn't dream of it, naturally. The rest, yadda yadda. I read it and absorbed what you're saying, but no time to help you out on the rest of it. Best of luck. Last edited by Caustic Logic; 6th April 2011 at 03:36 AM. I had hoped we could confine discussion of the Libyan defectors to the thread started for that purpose, but it seems it's not to be. Saif is savvy. He is also a suave, bare-faced liar, and it's hard to know when he's telling the truth and when not. I'm inclined to concur that there's a danger of the authorities pressurising Libyan defectors to come up with "evidence" supporting the Official Version of this story, and not apply due scepticism to whatever the defectors then come out with. Just as the original 1990s offer of $4 million for evidence against Megrahi and Fhimah lured a number of rats out of the woodwork to make up stories of varying degrees of credibility. We've been over the points I think Bunntamas may be trying to make, in earlier posts, and she doesn't seem to have taken any of the relevant replies on board. I don't think there's much point in going back over that. As I read what she's saying, though, I think she may be referring to Giaka's tale of Megrahi and Fhimah bringing a brown Samsonite case through customs at Malta on 20th December, whereupon Megrahi left on the morning of the 21st with only hand (carry-on) luggage. To the best of my knowledge, the only witness to Megrahi's having had any luggage large enough to require checking in on 20th December when he arrived, is Giaka. And this was one particular point which was thoroughly exposed as invention, right there in the Zeist court process Bunntamas otherwise relies on so heavily. Megrahi's trip to Malta was only an overnight. It's only a half-hour flight. It's perfectly normal for a man to take only carry-on luggage under these circumstances. I'm very sorry indeed to see such a meltdown of a rant from Bunntamas. I greatly desire a rational, fact-based discussion of the issues, but it seems that is not to be. Last edited by Rolfe; 6th April 2011 at 03:59 AM. right there in the Zeist court process Bunntamas otherwise relies on so heavily. Correction: It's the Zeist conclusion she relies on heavily. The process ... not so much. That reveals troubling things like the necessary accomplice being found specifically NOT GUILTY largely because the "star witness" she still seems to be freely citing (I agree that's probably it) was found to be "entirely unreliable," in their Lordships' soft characterization. He was a clown and a fraud paid $2 million for making up half the contents of the 1991 indictments that killed thousands (indirectly, of course...). Giaka is not credible, but he was crucial in scripting the original Libyan Lockerbie plot cartoon Bunntamas and the world was set in front of up 'til now. Hey, it's the argument I'm attacking. It's not personal, and not my fault there's a particular person attached the idea. Bad ideas using human shields! Could be the new motto of Victims of Pan Am 103 Inc.! Last edited by Caustic Logic; 6th April 2011 at 03:53 AM. Ah, confusing. Bunntamas's post following LGR's most recent post has vanished to AAH, and there's no point in linking to it because almost all the text has been modded out. Which makes the replies a bit redundant. Rewinding, could we maybe move any discussion of what the various Libyan defectors are saying or may say to the thread that was started specifically about that? I'm disappointed that boooeee hasn't returned. It he still believes the likeliest explanation for all this is that Megrahi levitated the invisible magic suitcase on to KM180 at Malta, I'd be interested to know why. I guess if people mainly get their jollies from taking down lunatic fantasists, something a bit closer to reality might not provide the same entertainment value. I sympathise. I've had my fun taking down twoofers too. But if that's all that it's about (and frankly the 9/11 stuff reached the shooting-dead-fish-in-a-barrel stage some time ago), then less of the high-minded declarations of minds willing to be changed, and more acknowledgement that the attraction is something quite different, might be good. But there is as yet no definitive, case closed, smoking gun revelation/admission/apology to make it crystal clear to everyone that there was a conspiracy, beyond all reasonable doubt. And there may well never be such a revelation. So in this sense, there is no definitive evidence in favour, certainly not to compare with the definitive evidence proving Watergate, Iran-Contra, etc. You're waiting for Vincent Cannistraro to confess all? Or even Hayes and Feraday? I doubt it. In my view, the Giaka episode on its own is pretty clear evidence of a conspiracy to frame Megrahi. Of course there's more, but that part is seriously jaw-dropping, with all the relevant CIA cables released in court. Right now, the whole thing has hit bizarro-land, with Musa Kusa appearing in England like the Trojan Horse. On one hand, there may be serious pressure on Libyan defectors from Gadaffi's regime to make stuff up "proving" Gadaffi did it, in order to gain favours from Britain and America. On the other hand, it's a little bit more complicated than that. One fairly large reason the lid has stayed on this is that it was to Gadaffi's advantage for that to happen. He had been given to understand that the price of "normalising" relations with the rest of the world, deals in the desert and all that, was for Libya to accept the blame for Lockerbie and not argue about it. He made token statements to the effect that "it wisnae us", but appeared at the same time to be on the side of those who didn't want Megrahi's appeal to come to court. And Megrahi went back to Libya vowing to publish the material he has in his possession which a lot of us are salivating for - and then didn't. Now, though, it's pretty obvious that Gadaffi's objective of being "normalised" is gone. He's being attacked by the people he was trying to do business with. Nobody has any idea how this will play out in the end. It could get quite interesting. What would really interest me is finding out which murderous bastards really did cause that plane to fall out of the sky, and why a bunch of people were so eager to let them get away with it. But you don't need to go that far to see that there was indeed a conspiracy to let them get away with it. Last edited by Professor Yaffle; 7th April 2011 at 05:33 AM. Your last post is why I can't get into the Lockerbie thing. I have no idea what you are talking about - the names, places, etc. Is there a concise version of the narrative (and how it differs from the 'official story') that I can find somewhere? It took me quite a while. It's been said that you need to be a "professor of Lockerbie studies" before you have a real grasp of the issues. There isn't a single explanation, but there are ways in. Many people find Paul Foot's pamphlet to be accessible, and although there are some holes in his story, and some missed tricks, it's pretty good all round. I particularly commend David Morrison's report on the trial, as a plain vanilla expose of the miscarriage of justice, without going much into conspiracies beyond that. Maybe to read before you start on Foot? Getting into the nitty-gritty, I myself started a thread called US authorities framed al-Megrahi for the destruction of Pan Am 103, but it didn't get the traction I'd hoped for. I may revive it some time. You also have to be able to recognise the actual CTs, of which there are quite a few. If anyone mentions Bernt Carlson, John Parker, a missing body, a second bomb or a suitcase full of drugs, run a mile. When I started looking at it, I didn't even know the Lockerbie plane was flight PA103. I didn't know it wasn't the same plane as flew from Frankfurt. I didn't know the bomb was supposed to have come from Malta. I didn't know who Tony Gauci was, or even Lamin Fhimah. It's a fascinating study, I have to say, and I think it would still be fascinating even if I hadn't passed the crater left by the falling engines only 48 hours later. It's also one that tends to make me sick to my stomach at the duplicity of my own country's criminal justice system, and leaves me banging my head against that perennial question, WHY? I still find it odd that scores of posters here are willing to come to threads fulminating with fury that Megrahi hasn't had the decency to die yet, or claiming that he caused the Gulf oil spill or whatever, but very few of them stay when the discussion turns to matters that seem to me to be a lot more interesting. Last edited by Rolfe; 6th April 2011 at 04:05 PM. Finally - it should be noted that some of the pro-Lockerbie conspiracy posters are by any normal definition, actually conspiracy theorists. They might be like the proverbial stopped clock on this one, but their presence partially nullifies the good work you have been doing to argue for the conspiracy case. You mean Caustic Logic? He has a tendency to run after conspiracy theories, I agree. He likes to consider them, and weigh up the pros and cons. He gave up being a 9/11 truther long before I encountered him. He's amenable to reason, I find. He's also indefatigable in ferreting out actual evidence. I think you do him a disservice. Who else? Buncrana, Ambrosia, me.... that's about it, recently. Any of us CTers? The fact that one of the board's most notorious trolls has been haunting the threads in question doesn't help, either. LGR has only posted a little, and only very recently. So he's trolling some of the time, and making sensible posts some of the time. He's quite funny. But he only showed up a couple of weeks ago. He hardly explains a year and more of Coventry. I suspect that you and I have differing definitions of the word "concise." Some bad men hijacked some planes in order to attack the U.S. in support of their religion. I'm actually curious about Lockerbie, but I'm not going to read a 32-page magazine with a glossary of acronyms. Last edited by carlitos; 6th April 2011 at 04:17 PM. Oh well. Some group of terrorists blew a plane out of the sky, as revenge for something the USA did that upset them. Precisely which group of terrorists and precisely what they were avenging, is disputed. Last edited by Rolfe; 6th April 2011 at 04:22 PM. Thanks. That's enough for me just now. Last edited by carlitos; 6th April 2011 at 04:37 PM. Sorry! Real life has been keeping me busy. Rolfe/Caustic/Buncrana - You've convinced me that the Bedford suitcase is probably the most troubling aspect of the official story. The timing of Bedford's statement gives it a lot of weight (the fact that it was given prior to knowing the type of suitcase that the bomb was placed in). Can you recommend any sites which would have a complete transcript of Bedford's statement? Or transcripts of the Camp Zeist trial? I've read through the excerpts on The Lockerbie Divide, but was looking for something more complete (that whole Camjob/Kamboj thing confused the hell out of me). Since you're looking for uber-concise, I think I can handle that. Libya was motivated to get revenge for a nearly three-year old U.S. bombing raid. A timer bomb was made inside a radio, a certain Toshiba model (BomBeat RT-SF16) that had its majority bought by a single company in Libya for mass distribution there. Intel agent Megrahi headed up the Malta end, purchasing brand-new (traceable) clothes at a small shop on Malta (on Dec 7) to pack around the bomb radio, and being at the airport when that bag was sent out on an Air Malta flight Dec 21. Megrahi's accomplice Fhimah supplied stolen luggage tags and used his airside pass to smuggle the bomb onto an outgoing flight. The unaccompanied bag was transferred twice, at Frankfurt and London, on the last transfer being placed in the deadliest corner of the container, bomb end out, by sheer luck. The Libyans used a highly exclusive (traceable) timer, MST-13. It could be set for way out over the ocean, but they chose instead to set it so it would almost surely blow up on or over land. It did, the radio, timer, and clothing bits were found, and led right back to the perps. The Camp Zeist (trial) decision was roughly the same as the above, minus several claims from witness Giaka (totally dismissed), and the acquittal of accomplice Fhimah (implicated almost totally by Giaka's made-up stories). The "evidence" he stole tags for a bombing was separately dismissed. The only evidence that could tell us Megrahi bought those clothes on December 7 is from the shopkeeper, Tony Gauci. He did point to a picture of Megrahi, under highly questionably circumstances, in 1991. But his first accounts to police, from Sept. 89 and into 1990, described a buyer more than 4 inches taller, 14 years older, darker, more muscular, and with a different face and hair from Megrahi, on a date that can only be Nov. 23, when Megrahi was definitely not on Malta. There's no doubt Megrahi was at the airport that morning, but little doubt Fhima was not there. No known accomplice. Air Malta's complete records of their stringest measures showed no unaccompanied bag anyway. Frankfurt's records disappeared for months, only resurfacing in one mysterious, unverifiable printout from an employee's work locker. If the record is genuine, it suggests but doesn't prove such a bag did come from Malta and transferred to the feeder PA103A and presumably to PA103. Witnesses Giaka and Gauci were quite likely influenced by the known and discussed rewards of $2 million if they helped convict the Libyans. The timer fragment is unusually large and in good shape for being inside the radio, nearly touching the semtex prior to detonation, 1/2" square, most recognizable corner, makes no sense with the explosion timing, and is surrounded by paperwork anomalies suggesting backdating (planting). This helped establish the radio model, that in turn helped implicate Libya. Iranians were mad about a six-month old US shoot-down of an Iranian airliner, paid the PFLP-GC $10 million to build altitude sensitive bombs. They were busted in October, but one bomb escaped, was somehow taken to London, manually placed by an intruder at Heathrow bomb-end out in the deadliest corner, it wasn't moved from there, and they got their revenge. The middle part's pretty hazy, but the bomb technology of the PFLP-GC matches perfectly with the explosion time, with a covered-up security breach at Heathrow that morning, and with the report of a suitcase matching the one Megrahi allegedly sent - in the deadly corner of the right container, before the feeder carrying the alleged Malta bomb even landed. For a slightly longer, less thorough, more literary take, check Gareth Peirce's article. Not totally precise, but for the big picture it's a good intro. Huh... That's rare. But I could tell off the bat you're a decenter and more reasonable person than average. It's probably hard for someone not wired for CTS like I am to get around the huge block of "but, the whole world says it's true, FBI, CIA, Scottish police, prosecutors, whole governments, all the media, courts of law... no friggin way can this case not be true." Most just don't even try to get around that. It's a rare bird that will. My hat's off to ye. On this issue, my site's the best resource around. Pretty much every relevant little bit re: the Bedford evidence is on there somewhere, albeit a little jumbled around. And it's accurate, but I appreciate the rigor of wanting to see the original context. I would also want to see it for myself (as I did). There is a site where the transcripts are available, but I didn't bother with saving the links. (was it Archive.org? Rolfe? Bunntamas (not Buncrana) has the links). It's hard to manage, hard to read and search in the formal format, and goes one day per page. What's better is the PDF Rolfe made. PM either one of us an e-mail or something, and if you can handle a largish PDF, it's the whole 86 days, word searchable and sweet. I've got a pdf of the entire Zeist transcript, though it's rather long at 14Mb. (It's around 3,000 A4 pages of 10-point arial.) I have to confess I've not been very successful in reading my way through it, and instead I've searched on key words to find passages that are important to whatever aspect I'm examining. Actually, I really ought to put it on a server so that people can download it if the spirit moves them, so to speak. Here's the whole of Bedford's evidence, in spoiler tags because of the length. The numbers in square brackets are the original page numbers. MR. TURNBULL: Number 915, please, My Lords, John Bedford. THE MACER: Witness number 915 on the Crown roll, Your Lordship, Mr. John William Bedford. Q Are you John William Bedford? Q And do you live at 5 Chesterton Terrace in Surrey? Q What age are you, please? Q What age are you? A What age? I am 60, sir. Q Thank you. In December of 1988, did you work for Pan Am at Heathrow Airport? Q And was your job description a  loader/driver? Q When did you begin working as a loader/driver; do you recollect? A 1980, I think, sir. Q Thank you. By 1988 and by December of 1988, did you work in a particular part of the airport? A In the interline area, sir. Q Thank you. And would you be there each day? A Each shift day, sir. Q I see. Can I ask you to look with me at some photographs, Mr. Bedford, Production 1114, and firstly at image P01. Do you recognise that as a view showing the interline shed? Q And did it stand alone at a separate part of the airport? Q How did luggage arrive at the interline shed? A It was brought by transport from other  airlines and put on a conveyor belt. Q I see. And who was responsible for bringing it to the interline shed? A A company called Whyte's. Q I see. And did they deliver it to the shed? Q Was that by vehicle of some sort? Q Can we look now, please, to image P02 within this booklet. Does that show a different view of the same shed? Q And we can see a yellow van in the photograph. Q Do you recognise that at all? A It's one of the vehicles that used to deliver the bags, sir. Q I see. And do we see that in the photograph there is a conveyor belt? Q And there are a number of bags on the  conveyor belt? Q How did the bags get onto the conveyor belt outside the shed? A The people from Whyte's used to put them on there, sir. Q I see. And did that conveyor belt then take the bags inside the shed? Q Can we now look at image P03, please. Does that show a view inside the shed? Q And can we see a conveyor belt in that photograph? Q Is that the conveyor belt that would bring the bags from outside to inside? Q All right. Now, there is also an x-ray machine in that photograph? Q Was that x-ray machine operated by people who worked for Alert Security? A They only x-rayed Pan Am bags, sir. Q I see. And how did they know if a particular bag was a Pan Am bag? A It would be on the flight ticket, sir. Q All right. Whose job was it to identify Pan Am bags as they came into the interline shed? A The Pan Am workers, sir. Q The Pan Am workers? Q All right. So would that include you? Q And once you identified Pan Am bags, what did you do with them? A We used to put them on the x-ray, sir. Q And whose job was it to check the bags as they went through the x-ray machine? A The Alert Security people, sir. Q And when you talk about Pan Am bags, are you meaning bags destined for a Pan Am flight? Q But we understand that they would have arrived from other airlines? Q And what did they do? A Used to put their bags on the belt as well, sir. A On that conveyor belt, sir. Q And where did that take their bags? A To the -- wherever they were picking them off from. Q I see. So might it be the case that interline baggage arrived in the shed, some of which was going to Pan Am and some of which was going to other airlines? Q And your job was to look for the Pan Am bags? Q And give them to the Alert worker who was going to x-ray them? Q So does that mean that some of the bags that came into the interline shed were not x-rayed? A I don't know that, sir. A Yes, some of them did x-ray, I think, sir. Q But not by the Alert workers? A Not by Alert, sir. Q I see. All right. At certain times of the day was the interline shed busier than other times? Q By the afternoon, was it busy or quiet? Q I see. And if it was quiet, would that mean that fewer bags were coming in? Q Would it mean that there were fewer workers there? Q Would you know which Pan Am flights were due to depart on any particular day? Q And would you then look out for bags for that flight? Q Did the people who worked for Alert ever help by identifying which bags were destined for Pan Am flights? Q Once the Pan Am bags had been put through the x-ray machine, what happened to them? A We then put them into a container for that particular flight. Q I see. And whose job was it to do that? Q I see. Did the people who worked for Alert ever help out by putting bags into containers? Q Were you on duty in the interline shed on the 21st of December of 1988? Q And flight 103 to New York would be due to depart late in the afternoon of that day? Q And was that a regular flight? Q Was that, in fact, the last Pan Am flight to be dealt with that day? Q Were you in the interline shed in the morning, do you remember, Mr. Bedford? Q By the afternoon, and say by about 2.00, were there any other Pan Am workers left in the interline shed? Q Were there still people working for Alert? Q Do you remember who? A Mr. Kamboj and Mr. Parmar. Q Thank you. And do you remember if any luggage arrived that was destined for flight 103? Q Some did. Thank you. And did that mean that you would have to put that luggage into a container? Q Was there a container available at the shed for that luggage? A I had to get a container, yes, sir. Q I see. You had to go and get one? Q All right. And was there an area that  you would go to, to select a container from? Q The containers we have seen already all have numbers on them. Q Do you, by any chance, remember the number of the container that you selected? A It consisted of the numbers 4041. Q Thank you. And having collected that container, did you take it back to the interline shed? Q And did you put some bags into that container? Q Do you remember now how many bags you put into the container? Q Do you remember if it was a lot or a few? A It was a few, sir. Q Do you remember where in the container you put the first bags? Q Can you explain to us how you would place the bags into the container? A Spine down, handle up, sir. Q I see. So is that standing upright? Q At the back of the container? Q Can I ask you to look at a photograph with me, please, Mr. Bedford, Production 1114, image P05. This, in fact, is you in the photograph, isn't it? Q Do we see that there are some suitcases already in that container? Q I am interested in the ones that are at the back and that are standing up. Do you see them? Q When you described to me a moment or two ago the way that you would place bags into the container, you said: Spine down, handle up. Q Do you mean in the way that we see those bags at the back of that container? Q Thank you. Can we close that production, please. Can I ask you to look with me, please, at a document, Mr. Bedford, Production 1217, image 1. We understand that this is a document called a container build-up record card. Q You've seen such documents before? Q And a document like this would be filled up to identify the containers that were used for any given flight? Q Do we see on this list the container that you selected for placing interline baggage into? Q At which row is it? Q That's container AVE 4041? Q Thank you. Can we close that production, please. Was there a gentleman working for Pan Am called Peter Walker? Q Was he your supervisor? Q After you had put some bags into the container that afternoon, did you go to see Mr. Walker? Q Was that at the baggage build-up area? Q And did you have a cup of tea with him? Q Did you take the container with you at that stage? A What did I do? Q What did you do with the container? A I left it in the interline area, sir. Q I see. How long do you suppose you were away from the interline area visiting Mr. Walker? A I don't remember that, sir. Q Can you give me an approximation? Q I see. Did you then return to the  interline area? Q When you returned to the interline area, did you see the container again? Q Were there any more bags in it by this stage? Q And where were they? A At the front of the container, sir. Q Were they also standing up in the way that you had put the ones at the back? Q What position were they in? A They were laying down, sir. Q I see. Can we look back at the photograph we saw a moment ago, Production 1114, image P05. We can see two suitcases in that photograph lying down nearer the front? Q I see. The handles of those suitcases in the photograph are pointing in towards the back of the container? Q Do you recollect where the handles were pointing of the suitcases that you saw? Q All right. Did you see who put those other two suitcases into the container? Q Who had been left in the interline shed when you went to visit Mr. Walker? Q -- about those suitcases? A Yes, sir, he told me he had put two more suitcases into the container, that he had x-rayed. Q I see. And that's what you saw as well? Q If you were packing a container  yourself, would you normally place suitcases to the back, to begin with? Q And would you normally place them side by side, in an upright fashion, as we see in that photograph? Q And once you had suitcases all along the back row, where would you put the next ones? A At the front, sir. Q Would you stand them up or lie them down? Q I see. If you were laying them flat, would you normally place the handle in one particular direction? A Depending on the shape of the suitcase, sir, yes. Q I see. Can you help me to understand that? A Well, if it was a square suitcase, I would place it with the handle out, but if it were a sloped suitcase, I would place it with the handle inwards. A Because when bags are put on top of a square case, they would stay upright. A But if they were placed on top of a sloped case, they would tip forward when the curtain was opened at the other end. Q Yes. And how does placing the handle inside help? A Because the slope of the bag goes towards the back of the container. Q I see. Do you recollect whether any more bags came to the interline area for flight 103 after you spoke to Mr. Kamboj? A I don't recollect, sir. I don't remember. Q All right. Did there come a stage when you took the container away from the interline shed? Q Where did you take it to? A To the build-up area, sir. Q Why did you take it there? A Because that's where my supervisor was, and that's where he asked me to bring it. Q What did you expect would happen with this container? A It would eventually be taken out to meet the 103 inbound. A Loaded, and then taken out to the 103 outbound. Q I see. How did you know it would be used to meet the 103 inbound? A Because that was the procedure, sir. Q -- of a container? Did you fill out any information for putting in that sleeve? A The container number, the flight number, and the types of bags. Q I see. What did you enter for the type of bags? A I can't remember, sir. Q Would Your Lordships just allow me one moment. Can I just ask you, perhaps, one more thing, Mr. Bedford. Was the container full by the time you took it from the interline area? Q Are you able to give me any more indication than that as to how many bags were in it? A Probably about eight or ten bags, sir. Q I see. Thank you. Were there any bags placed on top of the two at the front by you? LORD SUTHERLAND: Mr. Bedford, do you remember this photograph being taken? LORD SUTHERLAND: Were you asked to load a  container especially for the purposes of a photograph? LORD SUTHERLAND: You were. And in what way did you load it? Did you load it, as far as you could recollect, the way that you had loaded it on the 21st of December? A No, sir. They asked me to load it the way I would normally load a container. LORD SUTHERLAND: As you would normally load it; I follow. LORD SUTHERLAND: Well, are you able -- yes. What we see in the photograph is how you would normally load the container? LORD SUTHERLAND: Are you able to say if that is the way it was loaded on the 21st of December or not? A Yes, sir. I think it is, sir. LORD SUTHERLAND: You think it is? A Those particular suitcases, I would have done, sir. LORD SUTHERLAND: You would have done? A Yes, sir, because they are large and flat. LORD SUTHERLAND: Because of their shape? LORD SUTHERLAND: Yes. Advocate Depute, I don't think we have been told the date when these photographs were taken. Can you tell us that? Will it be on a label somewhere? It might be on the label for 1114. Your microphone is not on, by the way. MR. TURNBULL: The photographs are in Production 1114, and the date is given within the index of the photographs as the 9th of January of 1989. LORD SUTHERLAND: Yes. Thank you. Mr. Davidson. Q I think you've also told us, though, Mr. Bedford, that on occasions, the bags at the front, depending on circumstances, might be placed in an upright position, for example? Q And I take it, Mr. Bedford, it goes without saying that over the period of I think about eight years that you'd worked at the interline shed before the date of the disaster, you loaded hundreds and hundreds and hundreds of such containers? Q And so far as one day into the next was concerned, each, looking back, would take on a similar appearance, unless something out of the ordinary happened? Q That would be correct. On a given day, there would be goodness knows how many containers you would help to load; is that correct? Q You gave an alternative method of putting -- placing the bags at the front of the container; that's to say, standing upright? Q That would obviously depend on circumstances? Q That would depend, no doubt, on the size of the bag? Q It might depend on the size of the bag at the back of the tin? Q It might depend on the anticipated quantity of bags that were to go into that container? Q And on occasions you might have to move things around, depending on circumstances? Q To better fit bags in; is that correct? Q And would it be fair to say, Mr. Bedford, as I think you've already said in this Court, that so far as that particular day was concerned, the 21st of December 1988, you have no recollection of the precise number of bags that were put in that tin? Q No numerical record is kept at the  interline shed of the number of bags that come off the x-ray machine and go into the container? Q And you don't keep any personal record of that? Q You keep no personal record of that. Q No. And with the best will in the world, it must be very difficult, even if you are asked to look back perhaps only a week or two weeks after an event, to recall precisely how many bags you put on a given container at a given time? Q You indicated, though, that the container was not full? Q Is that correct? And you thought, and it's no more than that, and that's not a criticism of you, Mr. Bedford, but you thought that maybe there was between eight and ten bags? Q And that's an estimate? Q Is that correct? Because we are talking about a date almost 12 years ago? Q Is that correct? And in between times, since that date, no doubt, you've been involved in the loading of countless number of -- countless numbers of such containers? Q Looking at the photograph for a moment, Mr. Bedford, it's apparent, I think, that there are some eight bags in that container; is that correct? Or is it nine? Q You think there is nine. Q And you can see, I think, that of the -- of the bags at the back, two appear to be jammed in on an upper level in the angle; is that correct? Q In the angle, what I'm calling the inset part of the container. Q And do we see that what appears to be a metal, silver-coloured case at the back, in the back row in the left-hand side, is perhaps sitting at an angle? Q And that will be because of the bags that are to the left of it? Q Is that correct? I take it, Mr. Bedford, that although you said, I think to the gentleman who asked you questions first, that you didn't put any bags on top of the ones at the front, that it's possible that you are mistaken in that recollection, and that possibly a bag or two bags went on top of any bags that may have been in the front of the container? A Not put there by myself, sir. No, sir. Q I am just wondering, Mr. Bedford, how you can apparently be so sure of that, given what we've just been through. A Because when I went back to the interline area, sir, I took the container from there straight around to the build-up area. Q I see. And when you had left the interline shed to go to Mr. Walker, your recollection  is there were no bags at the front of that container; is that correct? Q I'm sorry. We are maybe at cross purposes, Mr. Bedford. When you left the interline shed to go to Mr. Walker's for a cup of tea. Q There were no bags at the front of that tin, that container? Q You didn't see the two bags that you are referring to being put in that container; is that correct? Q Your only knowledge of how they got there was what you say Mr. Kamboj told you, namely, that he had put them in? Q Can you help us with this, please, Mr. Bedford. Mr. Kamboj gave a number of statements to police in the weeks following the date of this disaster in which he maintained that he had never put any bags in that tin at all. Can you help explain that  discrepancy? A No, sir, I can't help you to explain that. Q -- the apparent discrepancy? Q Your recollection, you say, is clear that he did tell you that, and those two bags were in position when you returned from your cup of tea with Mr. Walker? Q And that the other, if not the same colour, was of similar colour? Q Well, perhaps I can assist you. If you can refer, please, on the screen to Production 1224. And if we can refer, please, to statement S1548A, and if we can turn to page 3 of that, please, image 3. You see, Mr. Bedford, this is a statement which you gave to a police officer called Adrian Dixon on the 9th of January 1989. Q You'd earlier -- previously, I should say, given a police officer a statement on the 3rd of January. This one is dated the 9th of January. All right? Q And if you look at the top of the page, please. Q I'm sorry, it's not the correct statement we have up on the screen. Page 3, please. MR. DAVIDSON: That's correct, My Lord. I'm obliged. Yes. Q I wonder, please, first if we look at the first page, S1548 A1, page 1, image 1. Could we magnify the heading, please. Mr. Bedford, do you see that bears to be a statement given by you with your details on it to a police officer, Adrian Dixon? Q If we can turn to page 3, please. I'm sorry, first of all, page 2, image 2. And if we can scroll up the way, please. Further up, please. If you can scroll up the way, please. Up, please, and stop there. Thank you. Do you see at the foot, or near the foot, Mr. Walker, three lines from the bottom, it says: I went to see Peter Walker in baggage build-up. Do you see that, three lines up from the foot of the page, Mr. Walker? Q Sorry, I'm calling you Mr. Walker, Mr. Bedford. Three lines up from the foot of the page? A I can see that, sir. Q I returned about 4.40 p.m., Camjob told me -- if we can turn to page 3, please. At the top, magnify that. Two further suitcases had arrived for PA 103 which he had put in the tin. All right? Q Do you remember saying that to the police? A I don't remember saying it, no, sir. A I don't remember saying it. Q Right. Do you accept that you did say it? Q It carries on: I looked inside the tin and saw the suitcases that I had put in the tin still in the same position. Do you see that? Q Lying on their sides in front of the other suitcases, handles pointing towards the back of the tin, were two suitcases. Do you see that? Q They were hard suitcases, the type Samsonite make. Do you see that? Q One was brown in colour, and the other one, if it wasn't the same colour, it was similar. Q In size, they took up the remaining base area of the tin. Q Now, would you have been telling the police the truth on that occasion, to the best of your recollection, Mr. Bedford? Q And if that is the truth, Mr. Kamboj had placed two suitcases of that description in the front of the container in your absence? Q Now, did you give a number of statements over a period of time to the police? Q Are any of these familiar to you, as you sit there now, or would you have to be reminded of them? A I would have to be reminded of them,  sir. Q I wonder if I can ask you, please, Mr. Bedford, some general matters about what was happening that afternoon. LORD SUTHERLAND: Are you going to be some time with this witness? MR. DAVIDSON: I'll be a little time. LORD SUTHERLAND: Well, we'll adjourn now for lunch and resume at 2.00. --- Proceedings recessed at 1.00 p.m.
--- Proceedings resumed at 2.00 p.m.
LORD SUTHERLAND: Yes, Mr. Davidson. Q Mr. Bedford, that afternoon, the 21st of December 1988, you say Mr. Walker, your supervisor, instructed you to take the container to the baggage build-up area. Q -- Mr. Bedford? Was that the reason why you took it there? Q There is no doubt about that in your mind? Q There's no doubt about that in your mind? MR. TAYLOR: I'm sorry to interrupt, but it's been drawn to my attention there is a problem with the LiveNote, My Lord. All of the machines in the back row here are producing scrambled eggs rather than -- in fact, all the back rows, I think. Both back rows. I wonder if a technician might assist. It's obviously very important that the machines record accurately. My Lords, I think that it may be possible for us to work. The counsel's row, the machines seem to be working, and -- I see heads shaking now. Maybe they are not working any longer. I'm sorry. LORD SUTHERLAND: Well, it rather looks as though Lord MacLean and I are working satisfactorily, but Lords Coulsfield and Abernethy are having a slight problem. LORD SUTHERLAND: There obviously is something wrong. LORD SUTHERLAND: Well, I would have thought it can't be the individual machines that are at fault, because quite a number of them seem to be doing it. MR. KEEN: My Lords, I am advised by the technician that this is going to take some time, as he puts it. LORD SUTHERLAND: Yes. All right, we'll adjourn until the matter is sorted out. --- Proceedings recessed at 2.05 p.m.
--- Proceedings resumed at 2.32 p.m.
MR. KEEN: My Lords, I understand that no sooner were you called back than that further problems manifested themselves on some of the screens. LORD SUTHERLAND: They all seem all right up here. MR. KEEN: It appears to be operating at the moment, My Lord. I would be content, certainly, to  proceed. It's simply not working, My Lord. LORD SUTHERLAND: Is anybody else having problems? MR. KEEN: If, in fact, it is only this screen that is not working, I will simply go to another screen. My concern, however, is that the LiveNote -- I suppose the LiveNote will be updated in due course anyway, so nothing will be lost. MR. KEEN: So if it is just this screen, I will go and use another one, My Lords. LORD SUTHERLAND: As it appears to be only yours that is out of order, Mr. Keen, perhaps you could use somebody else's for the moment. Yes, Mr. Davidson. Q Mr. Bedford, the container which you partially filled with interline luggage was bound for the incoming Frankfurt flight; is that correct? Q And there it was anticipated that bags from that Frankfurt inbound flight would be put on the same container and then loaded onto the PA 103 to  New York; is that correct? Q Why, Mr. Bedford, did you not take the container straight from the interline shed to the Pan Am 103 -- I'm sorry, the inbound Frankfurt flight? A Because I had finished work before the inbound 103 arrived. Q Was the normal practice, however, for you to take that container with some interline luggage in it to the inbound Frankfurt flight? Q But because, you say, the inbound Frankfurt flight was late, a different course was adopted? Q And it was Mr. Walker's instruction that you take the container to the baggage build-up area? Q Were you planning on leaving work early that day? Q What was your normal finishing time that day -- supposed to be for that day? A I think it was 6.00, sir. Q You weren't at -- you went off work at  two minutes past 5.00, didn't you, sir? Q Why did you leave early? A Because Mr. Walker said the 103 would be late and take me past my time, so I could finish early. Q When you took the container to the baggage build-up area, Mr. Walker, am I correct in thinking that you left it in a position approximately outside Mr. Walker's office? Q And that would be opposite the spurs which conveyed the London originating baggage to the baggage build-up area? Q And when you left the container, Mr. Walker [sic], in that position, am I also correct in thinking that you left it in that position with its curtain up? Q You took it to the baggage build-up area, Mr. Bedford, at about quarter to 5.00 that afternoon. Would that be correct? A I don't remember, sir. A I don't remember leaving work at that time, sir. Q Do you accept from me that you did leave at two minutes past 5.00? Q You do. And in order to clock off at that time, you had to go from the interline shed via the baggage build-up area to the load services office, where you clocked out? Q And to get from the interline shed using that route to the load services office where you clocked out would take you about 10 or perhaps 15 minutes? A Sorry, from the interline area? Q To the baggage build-up area and then to the load services office, where I think you clocked off for the day, would take you between 10 and 15 minutes? A Around about 10 minutes, sir, yes. Q All right. It lay there, Mr. Bedford, for something in the order of about three-quarters of an hour unsupervised, didn't it? Q There was no guard on duty outside Mr. Walker's office, was there? Q Well, you were familiar with that area at that time, Mr. Bedford? Q You would know, surely, that there was never any security guard positioned outside Mr. Walker's office? Q Is that correct? And if the inbound Frankfurt flight did not touch ground till 5.36 p.m., it's reasonable to assume that some minutes would pass before that plane could be unloaded; is that correct? Q Something in the order of perhaps up to about 45 minutes? Q And when you left the container outside Mr. Walker's office, it was facing away from his office, wasn't it, towards the build-up area? Q That area at the baggage build-up area, where Mr. Walker's office was situated, was quite a busy area at that time, wasn't it? A It could be, sir, yes. Q There was a lot of coming and going in that area, wasn't there? Q There was construction work on nearby, for example, in terminal 3, wasn't there? Q Do you remember there being construction work in terminal 3, it being extensively refurbished? Q You can't remember that? Q The roadway which went along past Mr. Walker's office was occasionally used as a shortcut  to enable people to get from one part of the airport to another; isn't that correct? Q And sometimes people would pass along that way with bags in order to try to verify their source. If, for example, a bag appeared without a tag on it, people would take such a bag to Mr. Walker's office; isn't that correct? Q Would the bag be left in Mr. Walker's office in those circumstances for him to deal with, or would it be left outside Mr. Walker's office? A I can't remember that, sir. Q Would you agree, Mr. Bedford, that if the inbound Frankfurt flight didn't land until 5.36 p.m. and was due to depart at 6.00 p.m., it did not leave a lot of time for luggage to be unloaded and transferred to the outgoing American flight? A Sorry, could you repeat the question, sir? Q It would be a bit of a rush job, wouldn't it? Q So far as the interline shed was concerned, Mr. Bedford, can I ask you one or two things about that, please. Am I correct in thinking that overnight it was left open, unsecured? Q Am I correct in thinking that at the point outside the shed where bags were put on the belt to be fed into the interline shed, there was no security guard? Q Within the interline shed itself, no one working there, provided they had a pass, was subject to any further security check? A As far as I know, sir. A Yes, sir, that's correct. Q So at times it would be a busy place? Q And at times there would inevitably be people who, doubtless, you wouldn't recognise? Q Is that correct? Once the bag had been x-rayed on the machine, a security sticker was placed on it by the Alert guard; is that correct? Q To establish it had been checked? Q And that tape was kept in the office, Pan Am's office in the shed when not in use? Q Was it not common knowledge at the time, Mr. Bedford, that the tape used for the security taping of bags was kept in an unlocked drawer in a desk in Pan Am's office in the shed? Q You don't remember. On occasions in the shed various containers would be getting filled up at the same time? Q Baggage would be coming in to the shed  destined for different airlines? Q And on occasions did it happen that the wrong bag or bags went in the wrong container? A Not to my knowledge, sir. No, sir. Q But, surely, on occasion that happened, Mr. Bedford? Q Can I have on the screen, please, Production 1224-S1548 at image 4 -- first of all image 1, I beg your pardon. If we can magnify the top part, please. Thank you. Do you see there, Mr. Bedford, that this is described as being a statement by you, gives your age, date of birth, address and so forth, taken on the 3rd of January 1988, probably wrong -- should be 1989, obviously, by constable -- detective constable called Adrian Dixon? Q I wonder if you'd turn to image 4, please. Thank you. And if you'd look, please, at the sentence that begins, I think it's eight lines up from the foot  of the page, please, Mr. Bedford, two words in from the right-hand side it begins: I have been asked ... Ten lines. Do you see that sentence, Mr. Bedford? Q I have been asked if it would be -- if it would have been possible for anything other than the bags that should be in the tin to be put in there, and I would say yes. Now, do you accept that you said that to the police, Mr. Bedford? Q And this was on the 3rd of January 1989? Q Do you accept that you would have been telling the police the truth? Q So as of that date, you clearly were of the view that the wrong bag could go in the wrong tin? Q But now, in your evidence here today, you don't think the same -- you don't seem to think that applies? You are not able to answer that, Mr. Bedford? LORD SUTHERLAND: I think, Mr. Davidson, it would be fair to the witness to put the next sentence to him as well, which indicates the circumstances in which something could go wrong. Q Whilst dealing with other baggage from other flights, it's not possible to keep the tin in my view all the time. Q Is that correct? So if the tin were not in your view, that might be one example of when the wrong bag could be put in that tin? Q So the point which you seem to make to the police was that the wrong bag could have got in the wrong tin? Q And that was possible? Q Do you accept that now, Mr. Bedford? Q Thank you. Did you ever see Pan Am on-line bags appear in the interline shed at all, Mr. Bedford? A Occasionally we would, sir. Q And in relation to them, was the practice that because they were on-line bags, they were not x-rayed but simply put in the container for the appropriate flight? Q That would be logical, though, wouldn't it, Mr. Bedford, because on-line baggage going from a Pan Am incoming flight to a Pan Am outbound flight would not be x-rayed at that time? Q Yes. Sorry, I was assuming you would know that. A It wouldn't come into the interline area, sir. Q You say it wouldn't come into the interline area? A I don't think it would come into the interline area, sir. A Not to my knowledge, no, sir. Q All right. At this time, Mr. Bedford, 21st December '88, were you aware of a security warning called the Toshiba warning? Q Concerning the danger of a bomb being placed in a Toshiba radio? Q And its passing through Heathrow? Q You knew nothing about it? Q I wonder if I can ask you, please, to look at a transcript of a Fatal Accident Inquiry where you gave evidence in Dumfries, please, Mr. Bedford. You'll be handed that document by the macer, Mr. Bedford. I think it's Production 1221, and if you can turn, please, first of all to page 2276, Mr. Bedford. THE MACER: We don't have that page in this book. Q Do you have a page headed up number 2276 before you, Mr. Bedford? Q Does your name appear halfway down that page? Q And is it headed up: Evidence for the Crown, continued? Q And it gives your name, your age, and your address, in answer to the first question; is that correct? Q I wonder if you'd move on to page 2294, please, Mr. Bedford. Q And between letters "B" and "C" in the margin, do you see the question reads: Can you recall whether on 21st December, 1988 any of the luggage that you dealt with or saw at the interline shed destined for Pan Am 103 was a bronze Samsonite case? Do you see that? Q Then the next question: Did you see a bronze Samsonite case? And you said: A maroony-brown Samsonite case, yes. Q Do you accept that's what you said to the inquiry? Q And do you accept that you were telling the truth to the inquiry as best you could? Q And was the next question: Where was that tin when you saw it? And did you answer: In the front of the container, lying down? Q And is the next question: Again in relation to the photograph that we have looked at in Production 42, photograph 1, can you point to where that case was when you saw it? And did you respond: Just there? Q And was the question: Indicating the left-hand case which is lying flat on the floor in the  front of the container? And you said: Yes, sir. Q And again, Mr. Bedford, do I take it that you accept making those answers at the inquiry, and that those answers were truthful? Q Thank you. And finally, does it go on: Now, I wonder if I could get in a bit more detail of the colour. What is your recollection about the colour of the case lying in that position? And did you say: I think it was a brown or maroony colour, hard-backed suitcase. Q We are now on page 2295. Were you then asked: I also used the word "Samsonite." What is your position about that? And did you say: I couldn't say that it was Samsonite, only that it was a hard-backed suitcase, a Samsonite type. Q Do you accept making these statements at the inquiry? Q And were they truthful? Q My Lords, just bear with me one minute. And again, Mr. Bedford, please, if you turn to page 2290 of that transcript. Q Do you have that in front of you? And I think, from the context here, you can follow that you are being asked about having left the container at the baggage build-up area. You'll see at the top, between letters "A" and "B," the question: You are pointing to an area in the top half of the sketch, just below the words "Baggage Transit," where we see two arrows; is that right? Q And then you are asked: Were you asked by police officers to indicate on a sketch of this type where you had left the container? Q And if you move down to letter "D" at the margin: Can you indicate how it was parked? First  of all, was it still open, in the sense that the sheet had been pulled down, or what? And you said: Yes, sir. Q By that, you meant that the container had been left open, with the sheet up? Q And the next question is: What position did you leave it in? You told us the geographical position, but where was the open end facing? And did you say: It was facing the build-up area. The open side was this side. So it was facing towards the words "Baggage Transit." Is that correct? Q Thank you. And you accept again, Mr. Bedford, that you made those answers at the inquiry? Q And that those were truthful? Thank you very much, Mr. Bedford. Q While we still have the Fatal Accident Inquiry on the screen, could we have page 2300, please. Mr. Bedford, I want to ask you, if you would, please, just arising from a question that my learned friend has been asking, the chap who has just been asking you questions, in relation to suitcases being put onto the container AVE 4041. Is it conceivable that persons other than you and Mr. Kamboj could have put suitcases onto that container? Q Yes. And, in fact, we may not need this on the screen any more, but at page 2300 of the Fatal Accident Inquiry, when you were asked that very question, you said: Yes, sir. Anyone who works at the airport. And that's about it, isn't it? Anyone who was airside could have done that? Q And that's because of the lack of security in the building, in the sense of no guards to ask people who were not working there what they were doing there? Q Can I ask you about two things, please, Mr. Bedford. The first is the colour of the suitcase that was at the front of the container. You remember being asked some questions a moment ago about that? Q What is your recollection now as to what colour that suitcase was? A None at all, sir. Q All right. Did you have much of a recollection as to its colour by the time you gave evidence at the Fatal Accident Inquiry? Q All right. And we've seen some of the questions you were asked about the colour of the suitcase at that inquiry. Q I just want you to consider two other things with me, please, that you said at the inquiry. Could we look at Production 1221, image 2295. And can we look at the bottom of that page, please. This is a part of your evidence that you've been asked about already, and it's obvious that you were being asked questions about the colour of the suitcase at this part of your testimony. Do you follow  that? Q Do we see that it ended at paragraph E to F with the question: Again this is no criticism of you, but I am anxious to know what the state of your evidence is about colour. In view of the different expressions of view over the period, are you able to be clear at all as to what the colour of that case was? And I think your answer was: No. MR. TAYLOR: My Lord, Your Lordship in the chair pointed out that context is a matter of fairness. I wonder if my learned friend for the Crown would read the entire sequence of questions relating to colour. The witness plainly accepts that the colour -- the colour question alternated between maroon and brown, and it's within that context that he said that he was unable to tell the colour. That can be simply achieved by directing the witness's attention to between letters "C" and "D" on the page that's on the screen. "A" and "E." Thank you. LORD SUTHERLAND: Well, Mr. Taylor, we can read that for ourselves and put it in context. MR. TAYLOR: Well, you know, it puts a  difficult -- a difficulty in my position. We've agreed, I think, in this trial that Your Lordships will take as the evidence that which appears in the LiveNote. Statements are appearing on the screen, not all of which are being read either by the witness or by counsel. When a statement appears on the screen, the entirety of that statement is not evidence in the case. It is only those parts of the statement which are referred to by the witness, and it was for that reason that I intervened, that an unfair gloss would be put on the witness's recollection if the context of that particular isolated question chosen by the learned Advocate Depute was left to stand in the LiveNote without its context in the page. LORD SUTHERLAND: Well, Mr. Depute, would you care to read into the record the passage from 2294E onwards, which appears to deal with the question of colour, in order that the passage you put to the witness may be put in its complete context. MR. TURNBULL: I am content to do so, but reject the criticism that lies behind the objection. But the simplest way to proceed is simply to do as Your Lordship suggests, and I will. Q Can we see, Mr. Bedford, that this is a passage in your evidence where you were speaking about the suitcase and its colour? Q And do we see at letter "C" the question: I think it's fair to say that you have been seen on a number of occasions by police and other investigating agencies; is that right? And your answer: Yes, sir. Q And the question then continues: And as far as the colour of that particular case is concerned, have you always expressed the same view as to what the colour was? And your answer: To my knowledge, I have. Q And then the question continues: Isn't it fair to say that on different occasions you thought it was brown or maroon, and at one point you were quite certain it was maroon? And your answer is: Yes. Q All right. I want you to look at another page now with me, please, image 2300. And you'll see that this is still a portion of your evidence. Q Can we look a little further down on that page, please. Do you see just below letter "D" the question: With regard to the suitcase that you saw lying down flat to the left side of the container, I would like you to think back as best you can. Could that suitcase have been a blue suitcase with a maroon or brown trim? And your answer was: I couldn't say. Q Then the question continued: You don't know whether it was or not? No, sir. But it could have been? It could have been. Q All right. Can we close that production, please. Now, there is one other matter that I want to  ask you about, please, Mr. Bedford. And to do so, would you look with me at Production Number 1224, image 1548-1. Thank you. And do you see that this is the statement given by you to the police constable called Mr. Dixon? Do you see his name there? Q And it was taken on the 3rd of January of 1989? Q I appreciate it says "'88," but it must have been 1989. Q Because it speaks about events at the end of '88. What I want you to do is to look with me to the third page of that statement. Thank you. And I want you simply to confirm that you told the police in the course of that statement about seeing the suitcases on the base of the container. Did you tell the police about that? You may see it just towards the bottom of the portion of the statement that's on the screen. A Yes, sir. Q Thank you. And I want you also, please, to confirm that you told the police, during the course  of that statement, about what Mr. Kamboj said to you? Q Thank you. I have no further questions. Thank you, My Lords. LORD SUTHERLAND: Thank you, Mr. Bedford. That's all. By this time, 12 years after the disaster, he has little recollection of the events. The real evidence is his original statements to the police in early January 1989, and his evidence to the FAI in 1990 - though even then, he wasn't sure about some items. As with Tony Gauci, I think the reliable evidence is in the early statements, rather than what is actually said on the witness box. Last edited by Rolfe; 7th April 2011 at 02:01 AM. Addressing your point more directly, I see what you're getting at, but I'm not sure I wholly agree. The Bedford evidence is of course key to the trial, and the fact that it was sort of hushed up at the time of the FAI a howling scandal. But it's key not so much for showing that Megrahi's conviction was unsound, but for showing that there is a plausible alternative scenario to the Malta theory. The evidence for the Malta transfer is so thin, so much based on supposition piled on assumption, that Megrahi should never have been convicted even without Bedford's evidence. No evidence of any shenanigans at Malta. No evidence of an unauthorised person airside there. All records showing no unaccompanied bag on that plane. No evidence of Megrahi having done anything untoward that morning. No alert from the Frankfurt x-ray screening. To base a conviction on the mere fact of one of two anomalous coding records on that bizarre souvenir printout appearing to indicate the Malta flight, when nobody knows what was in that tray, or even whether it was even coded for the transatlantic leg (all we know is that it was coded to go to Heathrow - most of the luggage didn't proceed to PA103), is ridiculous. That entry does not and cannot outweigh the evidence from Malta showing that no unaccompanied luggage was carried on that flight. I agree, what the Bedford evidence does is concentrate the mind. It's far more solid than the souvenir printout, and it identifies an actual unaccompanied brown Samsonite. But it's not so much evidence that Megrahi didn't do it, as evidence that someone else did. It's essentially because of following the trial, Foot's analysis in the Eye, and others that I can no longer remember that I don't participate. I did all that 10 years ago, and came to the same conclusion as Foot (by and large). Why go through it all again? Now I appreciate you may not like all your professors, and probably I'm coming across like a boring old fuddy-duddy saying the above. Well, that's because I'm a university history lecturer. Just to give you my read on things: judging from the discussions on other threads, I would say the balance of probabilities going on to clear and convincing evidence is in favour of a conspiracy. But there is as yet no definitive, case closed, smoking gun revelation/admission/apology to make it crystal clear to everyone that there was a conspiracy, beyond all reasonable doubt. And there may well never be such a revelation. Since gsm1988 seems to have taken his ball and gone off in a sulk, could we elaborate on this? I've often thought that the ultimate verdict on Lockerbie will be that of history. There is a metric ton of original documentation out there on the loose, way enough for serious historical study by academics with no preconceptions or agenda. Suppose we don't get a new appeal re-opened, or an official independent inquiry taking another look at the evidence, what conclusions are historians likely to reach? My own view is that the Giaka situation, with incontrivertible evidence that the CIA and the DoJ threatened and bribed a low-level informant to invent evidence incriminating Megrahi and Fhimah, and lie in court about it, is a pretty smoking gun. It even reached the point where the Lord Advocate (Colin Boyd, who is now emitting platitudes on the subject from the safety of the House of Lords) directly lied to the court in an attempt to keep the evidence of Giaka's unreliability from the defence. How much more do you want before it gets "beyond reasonable doubt"? It's not so much a question of what *I* might want. I do not doubt for one minute that a future historian, or even one right now, could write a convincing argument using the available evidence, and in the process show how the case was railroaded. Hopefully, one would do so while discussing the wider context of western-Libyan relations. You know, a chapter on the bombings in Germany and the retaliatory air strikes; and a chapter on Lockerbie and the aftermath, that sort of thing. Then, future historians can refer to such a work and go beyond the current record. In the nutshell version what people would probably write is 'Lockerbie was bombed and after an investigation Libya was blamed. After much diplomatic pressure a suspect was handed over and convicted in Scotland, later being released on health grounds, despite media protests in the US'. Only when someone can add a sentence 'in actual fact the bombing was carried out by Iranian-sponsored terrorists' (or whoever) will the nutshell summary deviate. Or when someone can write 'and so-and-so showed convincingly in their monograph that there was a rush to judgement/conspiracy/case of mistaken identity'. Even after such a monograph, the chances are that many unthinking summarisers will continue to claim that Libya dunnit. Only if there is some kind of 'closure' will that no longer be possible. If there is no 'closure', then a consensus will have to build within relevant academic specialist communities of researchers for "the verdict of history" to change. A somewhat useful comparison would be with the Reichstag fire issue. A great many believed that the Nazis set the fire themselves and blamed van der Lubbe for it. No Nazi was prosecuted for this, so the comparison is not perfect, but in due course historians examined the incident closely, and concluded that the fire was not set by the Nazis, but they exploited the opportunity it created. After this academic work was done, it was cited routinely by historians of the Third Reich. In the context of lectures on the seizure of power or the Nazis in power from 1933-39, then lecturers will now say, 'the Nazis exploited the Reichstag fire' and not even elaborate on the past belief that the Nazis set it themselves. Meanwhile, in the CT world, the Reichstag fire persists as a false flag. And I would wager that in the wingnut world, Lockerbie will persist as a Libyan operation. Neither belief would then need to be taken seriously in academia. Indeed, I realise such things take time. So far as I know, no historians are yet looking seriously at the matter, but no doubt it will come in time. You know, I feel I've done more research into the original documentation of this than I did scientific research for my actual PhD though! What do you think about the availability of evidence, and is this changing the game for your discipline? In the sciences, the easy availability of primary research papers, plus the ability of the internet to enable groups of people interested in particular subjects to come together, is already changing the game. It's especially noteworthy in the field of "alternative" medicine. Papers that would previously never have been subject to scrutiny by anyone but the committed believers they were written for are routinely being filleted on blogs. I myself have published two rebuttals to poorly-presented papers, in conjunction with fellow-authors I have never met outside this very forum. Physicists (for example) are now looking at the homoeopaths' claims that some sort of quantum mechanics effect is operating in relation to homoeopathic remedies - something that would simply never have happened twenty years ago. The pool of experts is widening, and including educated lay people as well as scientists from other disciplines. Now, I'm not a historian, but I'm not daft either. I have at my fingertips the entire Zeist transcripts, copies of original statements, photographs of the evidence, commentaries from other informed observers. I've written a lot about it. So have others, though they again are not historians. Are future historians going to start agains from scratch, or are they going to look at what has already been done, to inform their researches? I compare this to the GMC investigation of Andrew Wakefield. All the original spade-work on that was done by a journalist, Brian Deer. He has a blog about it, with facsimiles of the primary evidence, and a closely argued case that Wakefield was a knowing fraud in a number of respects. Anyone can read that blog, and make up their own mind about it. The GMC didn't accept Deer's assertions without verifying them, of course. But neither did they look a gift horse in the mouth. A journalist's blog led to a doctor being struck off. I therefore wonder if future historians will start again from square one, or whether they'll read the articles and the blogs and the forums as part of their journey towards historical truth. Joy, it's turned into anothe Lockerbie thread. Well, now you're in one. It's a pity the move was into the middle of a different ongoing conversation. I hope boooeee can pick it up, because his posts have been orphaned a bit. Anyone else get motion sickness when this happens? Slightly. But it probably had become a derail right enough. But when the usual suspects show up declaring that they're absolutely open to evidence, and will change their minds and form their opinions based on evidence they're shown, when they're self-evidently either avoiding the Lockerbie issue like the plague (even though it's one of the most topical things on the news right now and has been for months), or stone-walling the evidence-based arguments with a counter-argument from incredulity, I'm afraid I can't resist the temptation to point this out. How would you characterize this argument? At 2 feet the explosion rips open an airplane. At 2 inches it barely rips paper. Really? Actually, I think that was a bad summary (sorry CL). The Horton fragment is an esoteric feature of the case. It's anything but central. If it happens to be entirely on the level, it leaves the discussion in exactly the same place, given that the PFLP-GC had contacts in Libya and could easily have acquired a radio-cassette player in Tripoli or somewhere. The identification that was nothing of the sort, and the invisible levitating magic suitcase are far more pivotal to the debate. Well, it's good to get a stop by sometimes, saying, "hey I looked into this once, I agree, but I can't hang out and geek over it." Thanks, then. If you'd like to go so far as to argue from credulity that such a paper artifact just outside the bomb radio with 450 grams Semtex really would just get torn and a bit burnt, go for it. Otherwise, I'll say point taken, that's not proven either way, just seems to me (and Rolfe and others) somewhere down near impossible, suggesting it perhaps came into the evidence chain some other way. Otherwise, let's step back to the bigger picture. You've got a summary, still probably a little confusing, but hopefull short enough you can read it twice and you'll mostly get it. Do you think this looks like a strong case that we're poking little holes in, or something that already is full of gaping holes we're just pointing out? Last edited by Caustic Logic; 8th April 2011 at 02:41 AM. I think, basically, because of the continuing high-profile nature of the case and the wall-to-wall publicity all based on accepting as fact that Megrahi is "the Lockerbie bomber". It's not as if the case is just sitting there, after all. Four years ago, every morning my radio alarm would come on, and the headline news would be more doubts about Megrahi's conviction. The Crown were refusing to release vital evidence that would prove his innocence, was the main headline article. The entire mood music was that this guy's appeal was going to be a slam-dunk succcess. The case has hardly been out of the news in all that time, what with the appeal getting to court, and then the delays, and the application for the compassionate release, and the withdrawal of the appeal, and then of course he didn't die to order, and he was responsible for the Gulf oil spill, and so it goes on, now it's all about the revolution in Libya. This morning, I was awoken to the news that the Dumfries and Galloway police had interviewed Musa Kusa yesterday about the Lockerbie incident. Once more the starting position is that the bomb was introduced into the baggage system in Malta by Megrahi, therefore it was a Libyan operation. Most of the journalists seem to have forgotten the stuff they were reporting four years ago. The obvious fact that the bomb was never anywhere near the island of Malta, therefore Megrahi couldn't have done what he was convicted of doing, therefore we have no solid evidence at all that this was a Libyan operation, seems to be lost on everyone. So I guess that's "why go through it all again". My post was kidnapped from another thread. I demand to be repatriated! Do have a read at this article, from today. Most of the journalists haven't forgotten, though. The thing is, until something else comes up (and the current Libyan situation may give that opportunity), it's simply rehashing the same arguments over and over...though sometimes with excesses of supposition (as is often the case with any CT). And news-types tend to get bored of rehashing things. I might perk up when/if something else comes along. Weird initiative . thing. I'll have to see what they're hoping to achieve exactly. US victims families send a lawyer to Benghazi, the new center of honesty in the world, to initiate something. A bunch more "admissions of guilt," politically generated by rebels and thus, actually, allegations? When the facts are available disproving the whole thing, showing anything they say is made-up, and they ignore it? (For perfectly natural socio-political and psycho-economic type reasons). So far as Lockerbie is concerned, this initiative is, I believe, based on profoundly insecure foundations. Its title presupposes the guilt of the Gaddafi regime, its content presupposes the guilt of Megrahi. The words of defectors to Benghazi, or of Moussa Koussa, come to that, should be regarded with the greatest circumspection, taking their present situations into account. War generates fog, and truth is then even harder to come by. Exactly. The fog gatherers are at work when the season is ripe. They collect it by the bushels, spin it to thread and fabricate the threads into textiles of politically useful fiction, perpetually rubber-stamped with legal reality status. Again, it's the natural outgrowth of this rather peculiar, decades-long, slow-motion, mass-hysteria.